Colder Products PLCD14004 quick disconnect coupling. 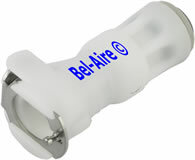 Ideal for disconnecting a water filter or humidifier running hot or cold water. 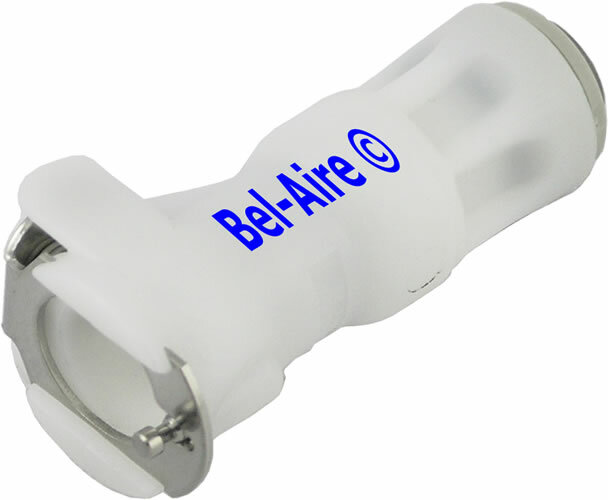 This coupling connects with all the Colder Products male couplings that we offer. This coupling has a John Guest SpeedFit® fitting for 1/4" tubing. SpeedFit® fittings are push-in connections for plastic or copper tubing (see below). Cut the tubing square ensuring it is free of score marks. NOTE: DO NOT use a hacksaw. NOTE: To avoid damage to the O-Ring, make sure burrs and sharp edges are removed from the end of the tubing. With the fitting clean and the tubing cut square, insert the tubing in to the SpeedFit connector. The tubing can be removed by pushing in the collet. Removing and inserting the tubing many times will cause a connection failure. It will leave a burr on the tubing damaging the O-Ring and will wear down the stainless steel teeth. The brand SpeedFit and John Guest are the registered trade-marks of John Guest International Limited. Colder Products purchases the SpeedFit components and technology.